Tamil literature is broadly classified as ‘Perilakkiam’ or major literary genres and ‘Sittrilakkiam’ or minor literary genres. The Sanskrit term 'Prabandham' was employed to denote the minor literary genres in Sanskrit literature. Similarly the word ‘Prabandam’ was first used by Adiarkku Nallar in the 12th century A.D. to denote minor Tamil literary forms. The list of 96 'Prabandhas' or minor literary forms was listed in his work ‘Caduragarathy by Saint. Veeramamunivar, a Tamil scholar who lived in the 17th century A.D. Some of forms of Prabandham are: Anthathi (அந்தாதி), Arruppadai (ஆற்றுப் படை), Barani (பரணி), Chathaka (சதகம்), Kalampakas (கலம்பகம்), Kathal (காதல்), Kovai (கோவை), Kuravanji (குறவஞ்சி), Matal (மடல்), Malai (மாலை), Pallu (பள்ளு), Pathikam (பதிகம்), Pillaithamil (பிள்ளைத் தமிழ்), Thandakam (தாண்டகம்), Toothu (தூது), Ula (உலா) etc. Basic elements of meter in classical Tamil poetry (செய்யுள்): The general grammar for a Tamil poem consists of Ezhuththu, Seer, Thalai, Adi, Thodai, and Oosai. Each Tamil alphabet (including vowels, consonants and consonant vowel compunds) is known as ezhuththu (எழுத்து) with short sounds (kuril) and the ones with long sounds (nedil). Two or more letters form 'Asai' (அசை), (syllable is more or less equal term). Ner asai and nirai asai are two forms of asai. Two or more asais form cheer (சீர்). Cheer is nothing but the metrical root or simply the word - two types: i.e, Iyar cheer (இயற்சீர்) and Ven cheer (வெண்சீர்). There is another important rule that governs the `seyyul' (செய்யுள்), this is called `thalai' (தளை) (connectivity rule). A set of well defined metric rules define thalai, the grammar for various forms of poetry. Another rule 'Adi' (அடி) decides the number of lines in a poetic form minimum two lines and maximum any number of lines i.e, Kural two lines; Venpa four lines. Yet another rule 'Thodai' decides sound and rhythm i.e, Edhugai (எதுகை), Monai (மோனை), Muran (, முரண்) and Iyaibu (இயைபு). The poems composed during Sangam period (3rd Century B.C. to 3rd Century A.D.) employed poetic forms like Venpa (வெண்பா), Kalipa (கலிப்பா), Asiriyapa (ஆசிரியப்பா), Vanjipa (வஞ்சிப்பா). Specific thalais for Venpa, Kalipa, Asiriyapa, Vanjipa were specified in the grammar. The poetic forms used in Sangam literature were difficult to understand by common man. Therefore the earlier four forms of Sangam poetry underwent modifications. The post sangam poets experimented various poetic forms. They used two cheers (syllables), six cheers (syllables), seven cheers (syllables) and eight cheers (syllables) and employed a blend of 'Viruttham' with kali and aasiriyam to convey specific themes potentially comprehensible to common public. Virutham form was used to enhance sound and rhythm. In due course 96 Prabandhams got evolved and many poets found them handy to convey their ideas. As a reult the innovations for Prabandhas poetic form included kali-veNbaa (கலி வெண்பா), Kochcha-k-kalippaa கொச்சக் கலிப்பா), Vanji viruttham (வஞ்சி விருத்தம்), Aasiriya viruttham (ஆசிரிய விருத்தம்) etc. In Tamil literature, 'Prabandam' - a form of poetry, in which there are 96 different types. Some of the popular forms of Prabandhams are: Ammanai (அம்மாணை), Anthathi (அந்தாதி), Arruppadai (ஆற்றுப் படை), Barani (பரணி), Chathaka (சதகம்), Kalampakas (கலம்பகம்), Kathal (காதல்), Kovai (கோவை), Kurathi Pattu (குறத்திப் பாட்டு), Kuravanji (குறவஞ்சி), Matal (மடல்), Narpathu (நாற்பது), Pallu (பள்ளு), Pathikam (பதிகம்), Pillai thamil (பிள்ளைத் தமிழ்), Thandakam (தாண்டகம்), Toothu (தூது), Ula (உலா), Vanji (வஞ்சி) etc. Agaval (அகவல்): Agaval is one of the 96 minor literary genres collectively known as ‘Sittrilakkiyam’ in Tamil. It is a type of Tamil poetry belonging to the family of Akaval paa (அகவல் பா). Example: Vinayakar Akaval by poetess Avvaiyar(அவ்வையார் பாடிய விநாயகர் அகவல்), Keerththith thiru agaval (கீர்த்தித் திரு அகவல்), Tiruchendur Akaval (திருச்செந்தூர் அகவல்), Arutperum jothi akaval (அருட்பெரும் ஜோதி அகவல்), Thiruvarutpa akaval (திருவருட்பா அகவல்), Mīnatchiyamman̲ akaval (மீனாட்சியம்மன் அகவல்). Number of lines vary from three to hundred. Ammanai (அம்மானை): Ammanai is one of the 96 minor literary genres collectively known as ‘Sittrilakkiyam’ in Tamil. It is a type of Tamil poetry belonging to the family of "Tharavu kochchaga kalippa" (தரவு கொச்சகக் கலிப்பா). This kind of poetry usually related with an indoor game of the Tamils i.e., Ammanai (அம்மானை) and the game was popular among teenage girls. Ammanai has the form of questions and answers. Ammanai poems normally adopts the rules of a venpa (வெண்பா), on the contrary it can occasionally have kalithalais (கலித்தளை) and belongs to the kalippa (கலிப்பா) family. Example: Akilathirattu Ammanai (அகிலத்திரட்டு அம்மானை), Ramappaiyan Ammanai (இராமப்பய்யன் அம்மானை), Tiruvasakam Tiruammanai by Manickavasakar (மாணிக்க வாசகர் அருளிய திருவாசகம் - திரு அம்மானை). Andhadhi (அந்தாதி): Andhaathi is one of the 96 minor literary genres collectively known as ‘Sittrilakkiyam’ in Tamil. It is the unique type of Tamil poetry wherein "the poem is composed in such a way that the successive poem should start with the word, that is the ending word of the previous verse." In few representations, "the last word of the a series of verses becomes the beginning of the very first verse." In this way the poetical composition arriving at the form of true garland of verses. In Sanskrit 'Andha' means end and 'Adhi' means beginning. Saint Karakkalammaiyar (Nayanmar) is believed to have sung the first Andhadhi in Tamil. 'Arputha Thiruvandhandhi' (அற்புதத் திருவந்தாதி), 'Irattai Manimalai Andhadhi (இரட்டை மணி மாலை அந்தாதி). 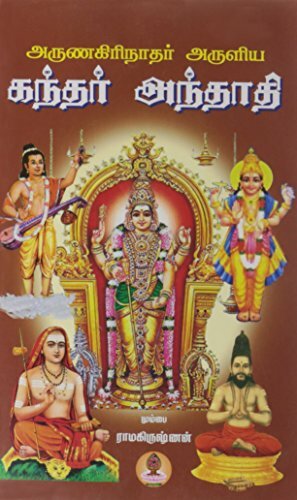 Saraswati Andhadhi (சரஸ்வதி அந்தாதி) by Ottakoothar and Satagopar Andhadhi சடகோபர் அந்தாதி are classics. Abirami Andhadhi (அபிராமி அந்தாதி) by Abirami Pattar and Kandhar Andhahdi கந்தர் அந்தாதி,is very much popular even today. 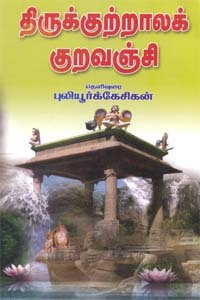 Mudhal Tiruvandhadhi (முதல் திருவந்தாதி) by Poigai Alvar, Irandam Tiruvandhadhi (இரண்டாம் திருவந்தாதி) by Bhoothathalvar, Moondram Tiruvandhadhi (மூன்றாம் திருவந்தாதி) by Peyalvar forming part of Nalayira Divya Prabandham. Thiruvannath Andhadhi (திருவண்ணத்தந்தாதி), Thiruvandhadhi (திருவந்தாதி) etc. Anubhuti (அநுபூதி): "Anubhuthi," is one of the 96 minor literary genres collectively known as ‘Sittrilakkiyam’ in Tamil. It means "Blessing" or "Boon." "Anubhuthi," is a type of Tamil poetical form adopted from Sanskrit. It is a kind of devotional poetry. "Anubhuthi" means, in simple terms,"God Experience" or "direct or immediate Experience of God" or "non-dual / Advaidic realization." 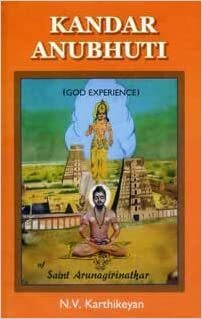 Arunagirinathar's Kanthar Anubhuthi is the Bakthi literature devoted to Lord Skanda. Sri Ramana Anubhuti is on saint Ramana Maharishi. Arruppatai (ஆற்றுப்படை): Arruppatai is one of the 96 minor literary genres collectively known as ‘Sittrilakkiyam’ in Tamil. It is a type of Sangam Tamil poetical form and forming part of the Pattupattu (பத்துப்பாட்டு) Ten Tamil Idylls - the anthology of ten mid length books from Minor Eighteen Anthology Series (பதினெண்கீழ்கணக்கு). Most of the anthologies in the Pattupattu collection use Arruppadtai style. The poems comprise descriptions of Tamil country, Tamil landscape and Tamil seasons. In Aatrupadai, a literary form in which you will find the treatment like travelogues. "A bard or a minstrel (பாணன்) who has received bountiful gifts from some wealthy patron is supposed to direct another to the same Maecenas." The poetical form takes every chance to bring out in depth the nature, landcape, irrigation, social life, and wealthiness of the territory that has to be traversed to reach the palace of the patron and his philantrophy. Example: Cirupanaarrupadai, Perumbanarruppadai, Porunarrupadai, Thirumurugarruppadai, etc. Kalambakam (கலம்பகம்): Kalambakam is one of the 96 minor literary genres collectively known as ‘Sittrilakkiyam’ in Tamil. It is a type of Tamil literature wherein the composition represents like a garland of different flowers. The poems shows different forms and content. The first Kalambakam was Nandikkalampakam (நந்திக்கலம்பகம்) by an unknown author. However the poet was the contemporary of Nadivarma Pallava III. Example: Madurai Kalampakam மதுரைக் கலம்பகம், Kailai Kalambakam, கயிலைக் கலம்பகம், Pullirukkuvelur Kalampakam (புள்ளிருக்கு வேளூர்க் கலம்பகம்), Thiruperur Kalambakam (திருப்பேரூர்க் கலம்பகம்), Azhakar Kalambakam (அழகர் கலம்பகம்), Thiru-aranga-Kalambakam (திருவரங்கக் கலம்பகம்), Kachi Kalambakam (கச்சிக்கலம்பகம்) etc. Kovai (கோவை): Kovai is one of the 96 minor literary genres collectively known as ‘Sittrilakkiyam’ in Tamil. It is a type of Post Sangam Period Tamil poems and composed and formulated to describe the hero and his heroism, valour, war skills, army, achievements, his ladylove and romances, heroic and noble deeds in a comprehensible form. It is a tribute to heroism. Example: Manicka Vasakar's Thirukkoavaiyar (திருக்கோவையார்), Thiruvarur Mummanik Kovai (திருவாருர்மும்மணிக்கோவை), Pandyan Kovai (பாண்டியன் கோவை), Thanjai Vanan Kovai (தஞ்சைவாணன்கோவை) etc. Kuravanji (குறவஞ்சி ): Kuravanji also known as Kurattipattu is one of the 96 minor literary genres collectively known as ‘Sittrilakkiyam’ in Tamil. It is a form of ancient Tamil dance drama. The Kuravanji dance-drama form belongs to Tamil dramatic literature. It also combines three aspects of Tamil literature: Iyal (prose), isai (poetry) and natakam (drama). Kuravanji or Kurattippattu songs pivots round the palm reading by the Kuratti or gypsy woman. Example: Thirukuttrala Kuravanji (திருக்குற்றாலக் குறவஞ்சி), Thyakesar Kuravanji (தியாகேசர் குறவஞ்சி) Azhakar Kuravanji (அழகர் குறவஞ்சி), Bethlehem Kuravanji (பெத்லஹேம் குறவஞ்சி), Viralimalai Kuravanji (விராலிமலை குறவஞ்சி), Tiruchengodu Ardhanarisvarar Kuravanji (திருச்செங்கோடு அர்த்தநாரீச்சரர் குறவஞ்சி), Sarabendra Bhoopala Kuravanji (சரபேந்திர பூபாலக் குறவஞ்சி) etc. Pallu (பள்ளு): Pallu is one of the 96 minor literary genres collectively known as ‘Sittrilakkiyam’ in Tamil. It is a type of Tamil poem composed during Nayak reign i.e, in the 17th and 18th centuries. Pallu genre songs were composed for the body of dancers or singers and they sing together in a gathering. Pallu literature depicts the social life of farmers of downtrodden caste. The affairs Pallu hero and the jealous attitudes of his two wives. Classes struggle, some classes triumph, ruthless economic exploitation and political oppression of the peasants by the landlord class are dealt in a satirical comedy. Example: Agasthiyar Pallu (அகஸ்தியர் பள்ளு), Kurukoor Pallu (குருகூர்ப்பள்ளு), Mukkoodar Pallu (முக்கூடற் பள்ளு), Nondip Pallu (நொண்டிப் பள்ளு), Tirukutralap Pallu ( திருக்குற்றாலப் பள்ளு) etc. Example: Kalingattu-Parani (கலிங்கத்துப் பரணி), Thakkayaagap Parani (தக்கயாகப் பரணி), Aggyavathaip Parani (அஞ்ஞவதைப் பரணி), Tiruchendur Parani (திருச்செந்தூர்ப் பரணி), Iranyan Vathaip Parani (இரணியன் வதைப் பரணி) etc. Sadakam (சதகம்) : Sadaka is one of the 96 minor literary genres collectively known as ‘Sittrilakkiyam’ in Tamil. Sadakam is the literary form from Sanskrit. 'Sadam' means One Hundred. The Tamil literay form comprising one hundred verses was known as Sadakam. Saint Manickavasagar's composition of Thiruvasagam Thirusadakam (திருவாசகம்-திருச்சதகம்) was sung on the Lord of Tiruperunthurai (Avudaiyarkovil). Kumaresa Sadakam (குமரேச சதகம்), Arapaleesura Sadakam (அறப்பளீசுர சதகம்), Tandalaiyaar sadakam (தண்டலையார் சதகம்), Kongumandala Sadakam (கொங்கு மண்டலச் சதகம்), Pandimandala Sadakam (பாண்டிமண்டலச் சதகம்) etc. Ula (உலா): Ula is one of the 96 minor literary genres collectively known as ‘Sittrilakkiyam’ in Tamil. This Tamil poetical form descended from the prevailing folk traditions. The form of composition have been improvised to suit the requirement of Ula genre. The Saivite and Vaishanavite temples follow the procedure of carrying the procession deities around the temple corridors in open palanquins, charriots, cars etc. The procession is preceded by temple dansuse, vocal and instrument musicians who sing hymns in praise of the procesion deities. The ruling king when proceeding in a procession around the palace has become the subject for Ula. Example: Thirukkailaya Gnana Ula (திருக்கைலாய ஞான உலா), Aludaiya Pilliyar Thiru Ula (ஆளுடையபிள்ளையார்திருஉலா) etc. Thuthu (தூது): Thuthu (Errand) is one of the 96 minor literary genres collectively known as ‘Sittrilakkiyam’ in Tamil. This form of Tamil poem is extended to the imagination of the poet. The hero seeks the help of animate objects like birds, animals, companion, danseuse, step-mother and inanimate objects like moon, clouds, breeze, Tamil language and even tobacco. Tirumaliruncholai Killaividu Thuthu (திருமாலிருஞ்சோலை கிள்ளை விடு தூது), Kachiyanantha Rudresar Vanduvudu Thuthu (கச்சியானந்த ருத்திரேசர் வண்டு விடு தூது), Madurai Chokkanathar Tamizhvidu Thuthu (மதுரைச் சொக்கநாதர் தமிழ் விடு தூது), Padmagirinathar Thendralvidu Thuthu (பத்மகிரிநாதர் தென்றல் விடு தூது), Maanvidu Thuthu (மான் விடு தூது), Pukiyilaividu Thuthu (புகையிலை விடு தூது) etc.